It’s not often I get to review a TV show that premiered 26 years ago. Yet the arrival of Seinfeld on Hulu gives me an excuse to revisit one of television’s most influential shows. Seinfeld became known as the “show about nothing” — a detail that worked its way into the series’ meta fourth season where Jerry and George (always a stand in for David) pitch a pilot for NBC with a nothing premise. But that moniker has always struck me as silly and incredibly unclever. It’s a convenient catchall that fails to describe the work the show was doing. Seinfeld is not a show about nothing. It’s a show about everything. Every mundane detail and petty annoyance of everyday life. Every ugly insecurity and shallow impulse we experience but dare not name. The show found a way of making those trivialities epic. And in doing so it illustrated the privilege of both its characters and its audience. Seinfeld is the epitome of white entitlement — a live action manifestation of #FirstWorldProblems two decades before we even knew that was a thing. 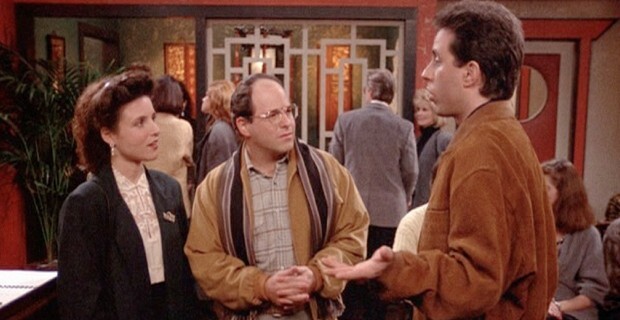 While so much about Seinfeld felt fresh and different, plotwise it was pretty conventional. Two of the series’ best early episodes — “The Chinese Restaurant” and “The Parking Garage” — are bottle episodes; a classic sitcom trope where characters are kept in one location for the entire episode typically forcing conflict. The innovation of Seinfeld was in presenting those old tropes with a harder edge. Anyone can do a bottle episode. The magic of Seinfeld was doing it with the worst people in the world, and doing it in a way that people would want to watch — even if its characters did evolve into full-fledge sociopaths by series’ end. Prior to Seinfeld, most sitcom characters inhabited happy universes where conflict was light and big jokes reigned and everyone felt good by the time the end credits rolled. Seinfeld said to hell with that. From the beginning, Seinfeld and David established a rule of no hugs and no lessons. Seinfeld was a deeply cynical show, where kindness was met with suspicion and good people were often casualties of Jerry, George, Elaine, and Kramer’s self-serving schemes. Yet the series proved that audiences would not only tolerate shows about friends behaving badly, they would revel in them. Without Seinfeld there would be no Arrested Development, no The League, no It’s Always Sunny in Philadelphia, no “Curb You Enthusiasm (obviously). In recent years, prestige sitcoms have found ways to dial down the cynicism while still striving for the high comedic standards set by Seinfeld. Shows like Parks and Recreation, Community, The Office, and Modern Family have proven there’s still room for warmth (and even hugs) in the modern sitcom. So does Seinfeld still hold up? For the most part, yes. Here and there traditional sitcom hokey-ness bleeds through in stilted line readings or broad set pieces. Jerry’s “oh, brother” and “here we go again” bemusement with George, Elaine or Kramer’s schemes feels forced at times. But for the most part, the it still works. Like the best sitcoms, Seinfeld‘s comedy is rooted in character. Jokes come organically from what we’d expect these characters to do in a particular situation and are not dropped from on high in service of the plot or the joke itself. However, not all the humor has aged well. Comic sensibilities have changed significantly over the last couple decades. Audiences are more sensitive to humor involving minority populations. It’s here where Seinfeld stumbles. At the time, the “Puerto Rican Day” episode from season nine was derided as offensive. It’s gotten no easier to watch. And I can only imagine the think pieces Salon and Jezebel would be churning out about the episode where Elaine conspired to turn a gay man straight. Likewise, the outrage generated by the show’s simultaneous body shaming and objectification of “braless wonder” Sue Ellen Mischke, would likely have been something to behold. In these instances, the show did work to make the joke at the expense of its characters and not the parties in question, even if it did occasionally miss the mark. Still, moments like these feel like unfortunate products of a particular moment we have long since passed despite what Seinfeld himself might have to say about it. At the end of the day, it would be unfair and shortsighted to dismiss the entire series for such missteps. On the other hand, to elide these offenses and laugh them off uncritically is something I can’t do. (I am a critic after all.) It’s best to look at these episodes within their cultural and historical contexts, recognize their shortcomings, and appreciate them for what they are warts and all.